Yes, folks, Snack Girl FINALLY bought some agave nectar. Why the resistance? Well, I have one gallon of local maple syrup in my fridge. My question is, is agave nectar healthy? Because when I was searching for agave nectar substitutes (I could've used honey), I found an article saying that agave is more processed than high fructose corn syrup. What do you think Snack Girl? So, photographed above is my $4.50 bottle of agave nectar and slurrrppp I am giving it a try right now! Sadly, agave nectar tastes nothing like tequila (also made from agave plants). It does have one gram of fiber which is unique - but I don't think it is such a significant difference that I would buy it instead of maple syrup or sugar. I decided to ask an expert about agave syrup because I couldn't figure out what was so special. Roger Clemens, DrPH (not the pitcher) was kind enough to answer a few questions. He has more than 25 years of experience in the food industry and academia, 40 peer-reviewed publications, and is currently and adjunct professor at USC. Snack Girl: Is the processing of agave syrup similar to the processing of cane sugar? Roger Clemens, DrPH: Evidence indicates the composition of agave syrup, cane sugar, and even high fructose corn syrup are quite similar. Agave syrup is extracted from a cactus, where cane sugar is extracted from sugar cane. While the extraction processes differ, the end result is quite similar. Snack Girl: Is there any health reason to reach for agave syrup instead of cane sugar when sweetening food? Roger Clemens, DrPH: There is not any compositional difference, or physiological response difference between agave syrup, cane sugar, or high fructose corn syrup. Each of these sweeteners contain a similar blend of glucose and fructose (also known as single or monosugars) and sucrose (also known as di-sugar or di-saccharide). Snack Girl: Why do you think agave syrup has grown in popularity? Roger Clemens, DrPH: The popularity of this sweetener has grown because it is considered "natural". There is no regulatory definition of natural. In fact, each of these sweeteners, agave and sucrose, occur naturally in nature (plants; just different plants). Roger Clemens, DrPH: My favorite snacks include iced tea and various tree nuts (e.g., almonds, walnuts) and Virginia or Georgia peanuts. Thanks, Roger, I LOVE Georgia peanuts. So, his conclusion is that the buzz about agave syrup is hype! The only research I could find that was positive was funded by the agave syrup industry - and I don't find that to be trustworthy. On the other hand, agave syrup is tasty and I like to use it to sweeten my smoothies because it is easier to pour and has ZERO maple flavor (which I don't always like in my drink). When used in moderation, all sugars are fine. Our problem as a culture is that sugar is in everything and we NEED to reduce our intake. Thanks! I have diabetic friends who treat agave nectar like poison and this makes perfect sense why! Hmmm...the reason I use it is that I was told by a local nutritionist that Agave has a lower glycemic index than sugar/honey. (And therefore doesn't crash your blood sugar.) Conflicting opinions...looks like I'm going to have to do some research! I am seeing a nutritionist right now and asked her about agave, since she recommends it over "white death" (sugar.) She said the body responds to it differently, that it doesn't affect blood sugars like sugar does. A local vendor at our farmers market is a diabetic and sells projects made mostly with maple syrup. He said he has noticed that maple syrup does not affect his blood sugar numbers like sugar does, either. Thank you snack girl! Nearly every blog I read totes Agave Nectar as the next Acai. To me, it just seemed to have the same stats as honey, the only thing special I could see about it was it was sweet without flavor. Thank you for this though! So glad you posted this. 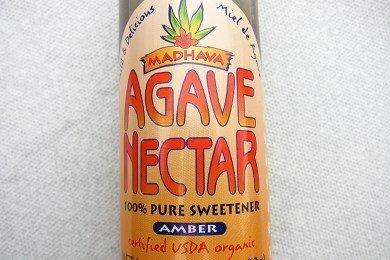 I was so close to picking up some Agave nectar yesterday, but decided against it until I knew more about it's benefits vs. sugar. Looks like I'll just cut back on sugar whenever I can, but definitely won't be adding agave to the mix. I haven't used agave nectar, and I don't think I'm going to. RAW honey is a good option, although it's very sticky! We have tried agave. I don't like the taste much; but my son loves it--maybe too much. Vegans don't eat honey (I'm not vegan but I do know that). And, agave nectar is sweeter than sugar so you can use less of it. I do appreciate the article though. Sweetner is not a super food! One thing I'm not seeing mentioned here is that agave is actually sweeter than sugar and honey, so it's easy to use much less. I'm not a huge fan of stevia, but like a little sweetness in my tea at times. I've noticed that a tiny bit will sweeten to the same level as regular sugar. And because I use far less, it lasts a long time, so the cost is worth it to me. I've also read that it has a lower glycemic index and won't cause you to spike and crash - I've found that to be true in my experience. Overall, my personal experience is that agave is far superior to highly processed cane sugars, but probably about as "good for you" as maple syrup. There's also a difference between dark raw agave (which I use and recommend) and the lighter heated stuff. The fact that agave is "highly processed" isn't really terrible unless it has additives and preservatives. Stevia has to be processed a lot too to be turned into a powder, but it's perfectly fine. I use the dark Agave Syrup from a company called Sweet Cactus Farms. Great for diabetics and vegan. It has a light mild taste. Only 15 calories,0fat, 4 carbs, 4 sugar. The serving is 1 teaspoon. I love it. Use it all the time, never spikes my blood sugar. I'm going today to buy another one. I snack on rice chips sweetened w/ agave and there is a difference for me.. i do not get hot flashes at all like I do when consuming high fructose, corn syrup, sugar and cane sugar.. so I do believe that there is a difference, I totally disagree with Roger Clemens. So whats the deal with the glycemic index and agave?? does it really keep you from spiking and crashing? I haven't seen any actual research that shows that agave has a low glycemic index. Only websites promoting agave seem to say that. However, I really do like to use agave nectar - I use it in my tea on occasion, and I use it in some baking instead of honey. It's been a while since I researched Agave because I too had heard it had a low GI; so I'm not able to site the references off hand, but what I found was it is extremely processed in order to be an edible syrup. The reason for the low GI was because it's processed in the liver not the intestines. It's my understanding because of a variety of "sweeteners" (agave included) are processed in the liver doctors are seeing younger people with damaged livers (almost like they were alcoholics). I had removed all processed food from my diet for an entire month. I then ate a couple slices of banana bread which I made with the agave and had the worst gas issues I'd had in a long, long time. Which is a by-product of the sweetener being processed in the liver. As with all sweeteners, I've decided Agave is no better than the others and they all need to be used in very small amounts. My sweetener of choice is Stevia. Check it out. I do have agave syrup because it is very sweet, dissolves easily and makes a nice non-flavored alternative to honey and maple syrup. I don't think of it as "healthy" as I agree it is sugar... but different things do different things to blood sugar and I don't react to agave. On the other hand, if I eat more than a quarter cup of fresh grapes without offsetting fat and protein, my heartrate doubles and I'm nauseated from the blood sugar rush. That's "natural" and doesn't agree with me... so we're all different! Thank you for the information! Can you please tell me how stevia fits into the mix? I use it a lot and wonder if it also has similar downsides (beside some people noting a bitter taste). After reading this interview, I looked for an analysis of why HFCS is not the same as other sugar. Here is the website: www.drmirkin.com/nutrition/honeyhtml. It gives a complete recipe for manufacturing HFCS(hint: there is no fruit involved). When I read that agave syrup was metabolized through the liver, I've decided not to eat that as well. I've heard this same thing before; that the body treats HFCS and glucose the same. He sounds like an intelligent man...until he says this very thing. A Phd doesn't seem to have budged him on this issue despite the evidence to the contrary. After reading this and all the comments I'm totally confused but since I haven't used or even considered using agave I'm not really worried. But I am quite interested in the "vegan" comment... why do vegans not eat honey?? Don't bees make it from flowers? How does that harm animals? Thought about becoming vegan many times but they seem to have many rules that don't make sense to me so I've always pushed the thought aside. I, too, use agave nectar on occasion. I have it on my oatmeal sometimes, and occasionally I'll use it in iced tea because it dissolves more quickly than honey or granulated sugar. I agree, it should be treated like any other sugar and used in moderation. As for the body handling HFCS the same as cane sugar, honey & agave? No. It doesn't. I was very surprised to see Dr. Clemens say that. @brandi, vegans don't eat honey because it's made by bees. Being vegan doesn't just mean not eating meat and things that literally come from animals (eggs, dairy). Veganism is really a lifestyle that respects all animals. So a true vegan won't eat honey (because honey is made by bees to feed their young), nor will a vegan wear leather. A person who doesn't eat any meat or meat products but eats honey (or wears leather) isn't technically a vegan, just a very strict vegetarian. Let's say you have a vegetable garden. You till the ground, plant the seeds, water it, pull weeds, try to keep the bugs away...When it's finally time to eat the vegetables you've worked so hard for, you find that someone has stolen them and left you McDonald's. Sure, you can eat McDonald's, but it's not what you've been working for and it's not really what you should be eating. Bees work hard to make honey, and humans take their honey and replace it with sugar water. Vegans do not see humans as having a "right" to steal from animals. I can understand the argument, but I'm not a vegan so I don't really agree with it. "Agave does technically have a low glycemic index, and may end up being being lower in calorie than regular sugar (same calories as regular sugar actually, but you can usually use about 1/4 as much since so much sweeter tasting). However, agave is not a panacea. It is high in fructose (which is the reason high fructose corn syrup is bad- HFCS has 10% more fructose than regular sugar and although that doesn't seem like much, your liver would disagree. So, I sincerely hope you do not have any liver issues or are pregnant/trying to get pregnant if you are using the agave (most varieties of it have been shown to contain anordin and dinordin which are steroids with contraceptive effects that could lead to miscarriage.)" Anyway, the big deal with fructose is that only your liver can metabolize it. The reason HFCS is bad is that it has found its way into everything thanks to the food industry including places you wouldn't expect to find it. Other sugars every cell in your body can use, but fructose is only in the liver. Small amounts of naturally occurring ones in fruits, etc. is not a big deal. However, concentrate it into HFCS, Agave (which is even higher in fructose than HFCS) and it causes problems. Your liver is doing all the work. This is why they are afraid HFCS, Agave, etc. leads to insulin resistance, type 2 diabetes, etc. There is nothing inherently wrong with either product, the trouble is wide spread adoption into every processed product. Or in the case of agave, using it in your tea, your coffee, your oatmeal, your baked goods, etc. because you think you are being 'natural' when in reality you could be seriously harming yourself. I always cringe when I see people at Costco with the huge double jug pack in their carts. There is an interesting podcast about HFCS and the science behind in on 'things you should know' where they set out to answer the question if it is bad or not. It was from awhile ago but can probably find it still on iTunes for download. Also, I have checked this with my kids pediatrician and she said it was correct. Just FYI. There is a huge difference between Agave Nectar and Agave Syrup!!! Please be informed so you can pass on correct information. You are calling syrup nectar and nectar syrup. Syrup is processed just like all of our other syrups. Nectar is what it implies, the natural juice from the plant itself. Not quite as concentrated since it is not exposed to added chemical and chemical expected reaction.